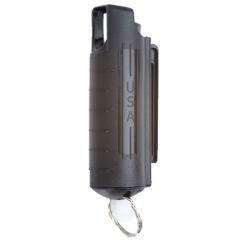 Keep your defensive tools right at your finger tips with Mace's 10% Pepper Spray Hard Key Case with UV DYE 11 grams. Not only does Mace offer the maximum heat with an OC formula of 10% pepper, but this heat also includes a UV dye for positively identifying a perpetrator after the fact. The Key Case model features a hard case that can live in a purse on a key chain and endure some wear and tear, and it is also easy to find in the dark thanks to a locked safety cap that glows in the dark. This spray offers 5-15 bursts in a stream configuration and reaches a range of up to 10 feet so you can retaliate in self-defense multiple times from a safe distance. Please note that sprays cannot be shipped via air, nor to a PO Box - shipping is via ground service to street addresses within the continental US only.